One of the most talked about yachts at Monaco Yacht Show 2016, Galactica Super Nova cut an impressive figure, dominating Port Hercules’ Quai Ranier I. The design of Galactica Super Nova was very much informed by the owner’s desire to cruise quickly, with a 30-knot minimum speed specified as a key requirement. The designer also picked out the top deck as one of his favourite areas, and the owner clearly agrees, as we are told that this is the most used space on board. Øino designed grey mullions for this deck, which make the yacht appear one deck lower than it actually is. The spectacular beach club is another key feature on board Galactica Super Nova, with twin strips of glazing allowing light to filter through the main deck swimming pool into the area below. 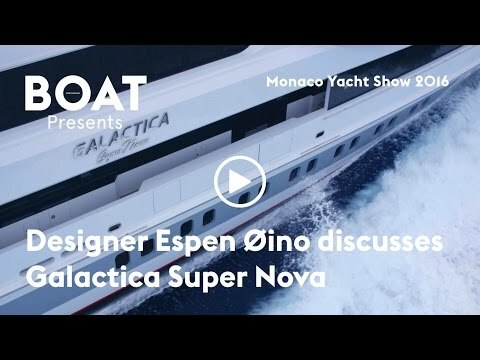 Following her successful debut at the Monaco Yacht Show, Galactica Super Nova will now head to Florida where she will be one of the must-see new yachts at the 2016 Fort Lauderdale International Boat Show.